The appeal of "The Help"
The big winner at the box office over the weekend was "The Help." In its second week out, it reached the top spot, according to studio estimates, beating out big brand names such as "Rise of the Planet of the Apes," the "Spy Kids" sequel, and "Conan the Barbarian." CBS News Correspondent John Blackstone points out that, "The Help" is one of those rare movies that didn't debut at No. 1, but rather climbed there after great word-of-mouth. In just two weeks, the drama about black maids and their white charges in the 1960s segregated South went from the No. 2 at the box office to No. 1. "There aren't that many movies a year," says Daily Variety Senior Film Critic Peter Debruge, "where you can tell anyone -- your mother, the priest, the hipster behind the counter at Whole Foods -- to go see a movie, and you can pretty must rest assured that they would like it." And that's what happened this weekend. "People are telling their friends about it, their family, they're social networking about it," observes Hollywood.com analyst Paul Dergarabedian, "and that's what's inspiring all this movie-going." 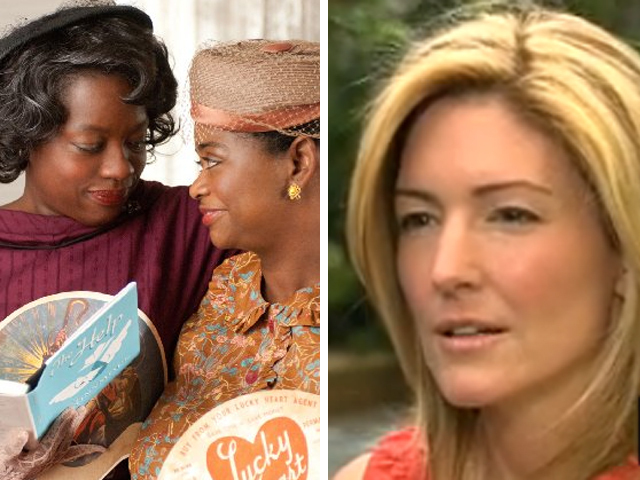 It's women who are making "The Help" a runaway hit and, like its characters, its audiences have been a racial mix. "Just coming from a long line of Southern women who grew up with black help, that's the reason why I'm seeing it," said a white patron. "It's about a time in our history that is not talked about a whole bunch, but that a lot of African-American women endured," notes an African-American audience member. The movie is based on the best-selling book by first-time author Kathryn Stockett, and directed by her friend, Tate Taylor, a Hollywood unknown. "This is," says Dergarabedian, "a Cinderella story." But it's not without controversy. Some critics object to the maids' story being told from a white perspective, and some object to what they see as stereotypes. "That is not all that we are," one movie-goer complained. "We're not just maids, and our black men are not all abusers." "I know I didn't get it all right," Stockett concedes, "but it's so important for people to explore what it's like to be in someone else's shoes." With its rise to the top of the box office heap, "The Help" is generating another kind of talk in Hollywood -- Oscar buzz. And experts say it's on-track to gross more than $100 million.